The new Kameha in Bonn is setting new standards for luxury hotels around the world. The lifestyle hotel is one of the best international real estate projects – in any case this was the opinion of the visitors and jury at the MIPIM, the leading trade fair for real estate in Cannes, who presented the hotel with the renowned MIPIM Award. The Lifestyle Hospitality & Entertainment Group (LH&E Group) runs the hotel, which also has rooms to cater for a wide range of events. The 18-metre-high glass event hall, for example, can hold up to 2,500 people. The promise of LH&E hotels is comfort and wellbeing in all respects. This also applies for the air conditioning of the Kameha in Bonn. The engineering team decided in favour of TROX as a supplier of countless grilles, slot, swirl and floor diffusers, volume flow controllers and sound attenuators. 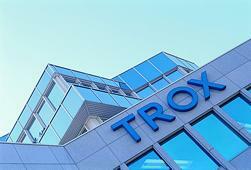 The smoke detectors and fire dampers from TROX guarantee people's safety. In the lobby, the rooms, the hallways and in the fitness area - TROX products guarantee a pleasant indoor climate and provide for people's safety. Due to their aethetic design they fit in perfectly in these lavish surroundings.